Sober Look: Is the treasury curve artificially steep? Is the treasury curve artificially steep? The treasury yield curve remains quite steep by historical standards. Typically such steepness is driven by expectations of higher inflation in the future. But as discussed earlier, that is not the case in the US (see post). Instead it is the expectation of the Fed's "taper" that has been influencing the shape of the curve. 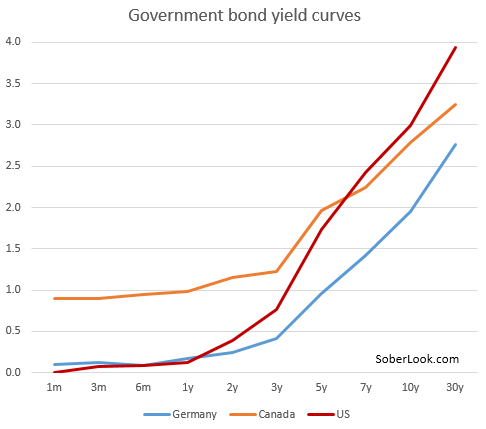 Measured as the difference between the 10-year and the 1-year yield, the US curve is now steeper than those in most developed economies, including Canada, Germany, France, the UK, Japan, and Australia. The only developed economies with steeper government curves are in the Eurozone periphery - the result of lingering credit concerns.